Submitted by admin on Fri, 30/09/2011 - 12:10. More and more people have been taking an ever closer look at their finances in an attempt to stretch their budget that little bit further. Despite a number of significant price drops in recent years, Ireland is still one of the most expensive countries to buy medicines in. To combat this, we will be taking a look at a couple of ways of reducing your medicines bill, so that you're not forking out any more than you absolutely have to. For most goods and services the price calculation is pretty straight forward. It will typically consist of a cost price + markup + VAT. So for an item that costs €10 from supplier, the merchant will add a markup of say 30% and VAT at 21%, bringing the total price to €10 x 1.3 x 1.21 = €15.73. So if you want to buy two of these, you'll be paying 2 x €15.73 = €31.46. Simple right? So why is this important? Read on! There is one small, but critically important difference in the way we calculate prices of prescription medicines as compared to other goods. Knowing this trick, will enable you to make a handsome saving over the course of a typical six-monthly prescription. To calculate the price of prescription medicine you must add up the cost price + markup + dispensing fee + VAT, thus arriving at the retail price. You will notice that there is a new element in this equation in the form of a dispensing fee. This fee will vary from pharmacy to pharmacy and you can expect it to be as high as €5 or as low as €3.16, so shop around and don't be afraid to ask. Regardless of how much it is, this fee is where we can make our saving. The higher it is, the bigger the savings. You see most people get their prescriptions monthly, paying this fee every single time they come in. Over the course of six months this amounts to six fees per item, where it could really only be one or two fees per item, if they collected six or three months at a time respectively. Very importantly, this fee is charged per item, so you if have two or more items, then you are looking at some potentially very big savings. Let's have a look at a very common scenario, where a female customer collects her monthly oral contraceptive pill Yasmin at the cost of €13.43 per month. Over the course of six months she will spend 6 x €13.43 = €80.58. If we dissect the €13.43 price, it is made up of a cost price of €6.62 + 50% markup + €3.50 dispensing fee. So had she collected the full six months at once, she would have only paid 6 x €6.62 x 1.5 + €3.50 = €63.08 for the same medicine, saving herself 5 dispensing fees worth 5 x 3.50 = €17.50 in the process. You may be asking yourself what about VAT? Well thankfully there is no VAT on oral medicine (i.e. tablets, capsules). You only need to worry about VAT when it comes to creams, ointments and ironically condoms (and there may be a few others). Girls taking Ovranette on the other hand have mostly copped on to this, as the cost price of the pill itself is only 84 cent, that's right €0.84, so the total cost for a six months supply ends up being only 6 x €0.84 x 1.5 + €3.50 = €11.06. Compare this to the cost of monthly collections of 6 x (€0.84 x 1.5 + €3.50) = €28.56 and it's quite obvious why the vast majority collect the full six months of Ovranette at once. Another great way to make a saving is to buy generic medicines instead of the more expensive proprietary brands. It used to be very simple, whereby generics would always offer at least a 10-15% cost saving. This got turned upside down for a while after a massive 40% price drop on a large number of off-patent branded medicines in February 2010. Having held off for as long as they could, generics have only very recently adjusted their prices downwards to match the brand name price reductions. As it happens, there is in fact very little price difference between the two at the moment, however, there are still plenty of exceptions making it well worth looking into. This is also something that you will want to keep a very close eye on in the future, as it is likely to offer even better savings going forward. So let's have a look at a few examples of how we can save money on generic medicines. Proton pump inhibitors or PPIs have always been one of the more expensive medicines that many just can't do without. Lansoprazole is available from four different companies, three of which are generics. As you will see, not all generics are priced the same. At the moment two of the three are actually more expensive than the original! Prices* are listed in the tables bellow. *Prices are only estimates, as all calculations assume a middle of the range €3.50 dispensing fee, which varies between pharmacies. This does not affect the price difference. All prices are subject to change. Prices accurate as of September 2011. A decent saving can also be made on Omeprazole 20mg. We can also find examples where the roles are reversed, like in the case of another PPI Esomeprazole. The generic brand Nexazole 20mg will set you back €2.93 more than the original Nexium 20mg. Another example of this is a very popular anti-inflammatory painkiller Diclofenac 50mg. Like we said above there are also plenty of examples where you won't be saving yourself more than a few cent, like in the case of Ramipril 5mg and Amlodipin 10mg. But let's end on a high with a few examples of some very nice savings on generic medicines. This is only a very small sample of generic drugs available. For your specific medicine talk to your pharmacist. If you wish to avail of these prices though, you will first need to ask your doctor to write your prescription generically, so that instead of a brand name like Zoton, it will say Lansoprazole or instead of Crestor it will read Rosuvastatin (Image 1). Submitted by admin on Fri, 21/10/2011 - 00:21. Irish Independent ran an article in this Monday's printed edition (17th October 2011), with a sensational headline stating that Irish pharmacists charge up to 354pc markup. Talk about twisting the truth! By selecting one of the cheapest medicines on the market (Eltroxin 100mcg) and adding the largest dispensing fee of any of the major chains (€5 in Boots) and using the HSE's reimbursement prices (which are, as we know, 8.2% below real-world wholesale prices) as the base, you can in indeed come up with this ridiculous figure. But that's like saying that Irish public servants earn up to €500,000. Yes it's true, but not for the vast majority of them. Pure nonsense! If I was to be as sensationally ignorant, I could come up with a headline saying that Irish pharmacists are making up to 5.5% loss on GMS cards. Sure that's true for the very expensive fridge items like Byetta, where the usual discounts and rebates do not apply, and the HSE is still only reimbursing their made-up wholesale price, leaving the pharmacists to pay the 8.2% difference, offset only by the lower €3.50 dispensing fee. But as you can imagine that's a fairly rare event, involving only a few low-single-digit euro sums and not really worth reporting on. If they were fair and balanced, they should also have included in their report that the wholesale price of many of the popular and just as life saving medicines, has gone down by 40% or more in the last year and that since the 1st July 2009, among many other measures, margins paid on DPS scheme by the state, were reduced from 50% to 20%, taking about €100 million out of retail pharmacy every year. As a result a number of pharmacies have had to close their doors, since they could no longer afford to stay in business. Let me give you just one example of the savings passed on by all the pharmacies to Irish customers, which seem to go unnoticed by the mainstream media. Prozac 20mg x30 Capsules, November 2009, €26.05; October 2011, €17.03, Saving €9.02 or 35% (assuming €3.50 dispensing fee). If we compare the wholesale prices, then the reduction works out at exactly 40%. Now is that not worth writing home about? Submitted by admin on Fri, 28/10/2011 - 11:39. If you are looking for price of your medicine you can calculate it by using PCRS's website at Primary Care Reimbursement Service - Reimbursable Items and adding about 9% (HSE's haircut to pharmacists), plus a 50% markup, plus dispensing fee (€3.16 to €5). 1) Type "Viagra" in the "description box". Ignore the likes of PCO, Doncaster, B&S Healthcare, etc. as these are parallel import products and you may or may not be able to get them from your pharmacy, and the prices are most likely going to be within a couple of cents of Irish licensed products, not what you will find on the PCRS website. So in this example we will take the price of €32.01 for the 100mg strength. 3) The real cost price is actually €34.87 or 8.9% more than the HSE are paying to pharmacists, so remember to multiply the PCRS price by 1.089 to get the true cost price. 4) Now we need to add a 50% markup, which means we need to multiply €34.87 by 1.5, giving us €52.31. 5) The last step is to add a dispensing fee. Assuming a reasonable dispensing fee of say €3.60, we get a final price of €55.91, although it could be as high as €57.31 in the more expensive pharmacies like Boots. Submitted by admin on Sun, 13/11/2011 - 00:01. In their response to the Irish Independent article referenced above, the IPU strongly disagree with it's findings and point out that "...3 out of every 4 medicines are dispensed by pharmacists on the medical card scheme on which NO mark-up is paid. In these cases, pharmacists are paid a basic dispensing fee that ranges from €3.50 to €5.00 for delivery of this scheme to patients." They also state that the article "...analyses only one, relatively small, part of a pharmacist’s business [the supply of medicines to private patients] and ignores the rest." Submitted by admin on Thu, 31/05/2012 - 23:28. The are some exceptions though, as the cheapest medications, where the €2 fee increase (now €7, up from €5) represents more than half of their cost price, i.e. NuSeals Aspirin 75mg, Eltroxin 25/50/100mcg, Ventolin Inhaler to name a few, will actually go up in price, but only very slightly (maximum €1.50). Also worth mentioning is that some of the popular hormonal contraceptive pills will also go up in price, but again only by a little bit. The fee there has gone up from €3.50 to €5 (an increase of €1.50), and with a lot of OCPs being relatively cheap, some of them having the cost price below €1, this will translate into a very slight price hike. That's assuming you're collecting them monthly, which as we've demonstrated in the article you really shouldn't be doing, especially not now with the new pricing structure! Submitted by Peter (not verified) on Tue, 15/01/2013 - 20:14. You omitted to mention the best way of reducing the amount you spend on medications: Buy them abroad. You may also set-off your medicine purchases elsewhere in the EU against income-tax when making your annual return. I have been buying mine in France twice yearly for the last 10 years. I am on Nexium, Amlodipine, and Lipostat. The French price is just less than half the Irish price. Even greater savings are to be had in Spain. 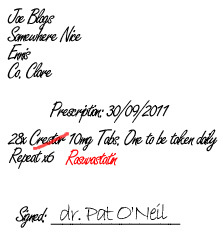 I have never found foreign pharmacists to be anything less than delighted to fill Irish scrips, and always helpful and prepared to dealy with you in english. *The Irish Pharmaceutical Healthcare Union claims that Irish drug prices are calculated on the average of prices in 9 other EU countries. This is a highly misleading claim. In fact, they are Calculated *on the basis of* the average of the prices in 9 other EU countries - but with a huge mark-up on that average (A very different thing!). Irish prices are significantly higher than the average price of equivalent drugs in even the most expensive 9 EU countries! Submitted by Conall O'Seaghdha (not verified) on Tue, 22/01/2013 - 11:55. Can you send me/direct me to a list of bottom-line dispensed generic drug costs for the commonly prescribed anti-hypertensives in Ireland? Submitted by admin on Tue, 19/02/2013 - 12:42. Thanks for your contribution Peter. You make an excellent point. Indeed a lot of Irish patients are now buying their medicines abroad, especially in Spain. As you point out it is entirely legal to do so, so by all means, if you have that option you should avail of it. Submitted by admin on Tue, 19/02/2013 - 13:03. Thanks for your question Conall. Not 100% sure if that's what you're looking for but check out page 77 of HSE's STATISTICAL ANALYSIS OF CLAIMS AND PAYMENTS 2010 (the latest I could find) and you'll find Table 19.1 GMS: The Top 100 Most Commonly Prescribed Products in the Order of their Prescribing Frequency. Hope that helps! Submitted by Paddy Marron (not verified) on Thu, 07/03/2013 - 12:49. Your advice on buying the 6 months of supply of prescribed drugs together and so save on chemist's prescribing charges is a useful one. But there appear to be a number of problems to doing so. 1. What happens if each months prescription exceeds €144 and the chemist claims back the excess from the HSE. Will the chemist be able to claim back 6xexcess in one claim? Even if he can do so the cost of paying out 6x144 in one payment is going to be painful. 2. Also can you tell me what prices does the HSE work on when refunding the chemist on the excess of the limit €144? Submitted by admin on Wed, 03/04/2013 - 00:28. 1) Buying 6 months at once will not work with the Drugs Payment Scheme (DPS) due to the 1 month limit. Unfortunately there is no way around that, but what I will say is go to Boots where they've completely abandoned the 50% markup that most chemist still seem to be charging, so you may end up not even going over the €144 threshold. If you still go over then there's nothing you can do apart from going abroad. 2) It is neither. What the chemist charges you up to €144 appears to still be completely up to the individual pharmacy even though the HSE has warned chemists that they should only be charging 20% markup + fee on DPS. Once you hit the €144 threshold the rules change. The pharmacy then has to recalculate the prices with a 20% markup and standard fee and if the price still exceeds €144 then they claim the difference back from HSE PCRS. On the other hand if the total is below €144, then they usually don't send any information forward as it could potentially be used against them. Medical cards are reimbursed at cost + fee, actually make that cost -8% + €5 staggered fee (€5 for the first 1667 items, €4.50 for the next 833 items and then only €3.50 for any additional items that month) as PCRS wants some of those rebates that pharmacies get back. Submitted by joan (not verified) on Tue, 09/04/2013 - 14:54. Submitted by admin on Wed, 01/05/2013 - 21:06. I don't think the prescription would have to be written in any specific way, but to be on the safe side I'd get it written generically, ie. escitalopram. As regards prices and 6 months supply, I'd ring a pharmacy in Spain and ask. I think they're well used to foreigners stocking up, so I don't see a problem there at all, but I'd drop the Rx in as soon as possible, just in case they don't have enough in stock, seeing as you're only going for a few days and they might need to order in extra packs. Either way let us know how you got on once you're back. Submitted by Anonymous (not verified) on Wed, 12/06/2013 - 12:20. My pharmacy will only dispense a repeat prescription(s) each month because we go above the €144 monthly limit in one single month ie we only pay €144 every month because of the Drugs Payment Scheme. So how is it possible to buy 6 months supply in one month as the remaining 5 months are "free". Submitted by admin on Fri, 28/06/2013 - 21:51. It's not possible to buy in bulk on the DPS scheme precisely because that would make the other 5 months free. There is a limit on the DPS scheme of one month's supply of medication per family unit per pharmacy up to the threshold, currently at €144. Your options would be to ask your pharmacy to "forward-date" your next months supply of medication if you were say going on a long holiday, however that would not save you any money, just a trip to the pharmacy. You could also be a bit sneaky and go to another pharmacy in the same month, however they may notice that you've already received this months supply by the stamp on the back of your prescription. One other thing I will say to you is ask your pharmacy how much mark up they're charging you. They should only be charging you 20% markup, but below threshold a lot of them are still charging 50%!!! If they won't tell you, well then it's time to move. Boots will not charge you any markup at ALL, just a €7 flat fee per item per month. Depending on the cost of your medication you may not even reach the threshold. Because of this pricing structure Boots will not dispense more than one month at a time (or they will simply charge a multiple of one months price) with a handful of exceptions, contraceptive pill being the biggest one. Submitted by John Maher (not verified) on Wed, 27/11/2013 - 09:55. Submitted by admin on Fri, 13/12/2013 - 01:18. Thanks for an extremely relevant question John! With the big shift happening towards generics right now, can you insist on your preferred brand without having to pay the price difference? The short answer is no, but let's have a slightly closer look at this problem. The first medicine to undergo this process was Atorvastatin, better known as Lipitor. Things went well enough and on the 1st November 2013 Atorvastatin became the first reference priced molecule on the Irish market. Pfizer were not about to stand idly by, while generics ate up their precious Atorvastatin market and reduced the price of Lipitor to a few cent below the reference price! Not much joy for the generic companies then, but great for the consumers and the HSE. Surprisingly enough things seemed to be going relatively well, but just like anything else involving the HSE this story was about to take an unexpected turn. On the 1st of December 2013 we were supposed to have received reference prices for the next two molecules, Esomeprazole and Rosuvastatin, also known as Nexium and Crestor respectively. That was two weeks ago and still no sign of the promised reference price. It is now expected to come out next month, but only for the 20mg Esomeprazole, with the 40mg Esomeprazole and hopefully all strengths of Rosuvastatin following in February 2014. That’s a two month delay in a three month process. It begs the question why are they dragging their heels even more than the already slow process allows? I’ll leave that one to your (vivid) imaginations. It would appear then that it’s anybody’s guess how long it will take for the other molecules to join the lonesome Atorvastatin in the reference pricing revolution, but one thing is for certain, it will eventually happen for many, many more. The next molecules on the list are Omeprazole, Pravastatin and Lansoprazole. That’s Losec, Lipostat and Zoton to you and me. And that’s just the beginning. Sometime (early?) next year we expect to see reference prices also for Quetiapine (Seroquel), Ramipril (Tritace), Co-Amoxiclav (Augmentin; if they can get it back in stock), Lercanidipine (Zanidip) and Pantoprazole (Protium). The list goes on and on, but I won’t bore you with these somewhat unnecessary details anymore, and instead I’ll try to answer your question. Luckily for you, the HSE haven’t set their sights on too many of your medicines, primarily because most of them are quite cheap. The only one of your medicines that has found its way onto the HSE’s short list is Cozaar (Losartan). Therefore once the IMB publishes the list of interchangeable medicines containing Losartan, the pharmacist will be able to switch Cozaar for any of generics on that list without consulting your doctor. What they can’t do yet(!) at that stage is force you to pay anything extra. That’s until the HSE comes out with the reference price one to two months later. At that point you will need to have a conversation with your doctor and make a case for why you should not switch to the generic version. If the doctor is satisfied with your arguments he/she will write “Do not Substitute” on your prescription and the pharmacist will dispense the branded medicine at no extra cost to you. Hopefully that was helpful for you John, but now I have a question for you. You really should not be paying €144 for the medicines on your list. According to my calculations, even the more expensive pharmacies shouldn’t be charging any more than €56-60 for a month’s supply. You must be getting some other medicine as well or you are sharing this DPS account with your spouse or dependent children. If you are spending in excess of €144 per month for your family unit, any co-payment required due to reference pricing will be charged in addition to that €144. Submitted by admin on Wed, 29/01/2014 - 13:36. Just wanted to add our 2 cent to this explosive news story that broke recently about a Dundrum based pharmacy promising to match prices in Northern Ireland. After reading a number of articles, watching TV interviews and speaking to a lot of people about it, here's what we think is going on. Healthwave owner Shane O’Sullivan is offering a scheme (as if we didn't have enough of them already) whereby you pay him €25 up front to access these lower prices on generic medicines (branded/original are not included!). Percentage-wise he's offering huge discounts on generic medicines ie €4.95 for a 28-day supply of Atorvastatin, vs. over €10 in most other Irish pharmacies. OK that's a saving of roughly €5, however in order to get your €25 back you'll need to purchase 5 months of medication just to break even, then you'll save 7x €5 = €35 over the course of a year. If you have multiple medications that saving will be bigger of course, but if you’re only on one or two, it's really not worth the hassle of at least two trips to Dundrum unless it's just up the road from you. The big question nobody in the mainstream media is able to figure out (and Shane is certainly not forthcoming with it - dodges the question like a true politician), is how is this guy making money, selling medicines at half or less of their normal price. The media seem to think pharmacies operate in secret like drug cartels, when nothing could be further from the truth. Prices are listed publicly on the HSE's website on the link available in our article above, written 2.5 years ago. They are set by manufacturers in agreement with the state. That's politicians, big businesses and doctors, pharmacists don't even get a look in at those meetings. So I guess somebody is not doing their homework or they're just playing dumb to sell newspapers with hyperbolic titles. Anyway let's get back on topic of how is Mr O’Sullivan able to offer generic medicines at those prices and still make money, albeit very little money. It's quite simple really. It's called discounts, HUGE discounts in fact. I'm talking 80-90% on some generics, but a bare minimum of 50-60%. This is not unique to pharmacies now, its how the business world operates. What is unique though is the level of discounts. And the reason they're possible is the ridiculous prices that the HSE has negotiated with drug manufacturers allowing generic manufacturers and pharmacists to take advantage of it. They’d be crazy not to! After all, selling medicine is a very competitive business. If it wasn't for the troika forcing Ireland's hand things would still be the same. For consumers' and taxpayers' sake though the HSE has been continuously driving down medicines prices and eliminated all mark-ups on all state schemes(!) leaving very little juice in the system to live off and pharmacies are definitely feeling the squeeze. Recently introduced reference prices are slowly but surely driving down both profits and discounts for pharmacies. It's about time says you, however with this last lifeline now under attack, pharmacies are now in real danger of closing down. If it wasn’t for front of shop and OTC sales subsidising dispensing income, a lot of pharmacies would already be closing their doors. And that’s what nobody in the general public or media seems to understand. Submitted by admin on Mon, 16/01/2017 - 21:57. Healthwave have now started a medicines "price comparison" website, where strangely enough the only pharmacy listed is their-own.